Creamed Kale á la "Oui, Chef"
I’m a huge fan of “Oui,Chef”, his blog and fabulous collection of recipes. I drool over his photos and envy his culinary talent. He is also a really nice, approachable guy who loves his family and keeps them at the center of his life. When I saw his post about creamed kale, I thought what terrific timing, since I was due to receive a case of winter greens from Cut N Clean Greens. So, I emailed Steve, asking if I could feature him and his recipe in a post. Here it is, creamed kale á la “Oui, Chef”. Thanks, Steve, for allowing me to do so. Of course, I had to tinker a bit with your recipe. You will no doubt cringe to read that I chose to microwave my kale instead of boiling and “shocking” it. I subbed some Meyer lemon zest for the red pepper flakes, in deference to Larry’s aversion to hot pepper. I had some pistachios in the cupboard, so I toasted a handful and threw them on top of the finished dish. 1. 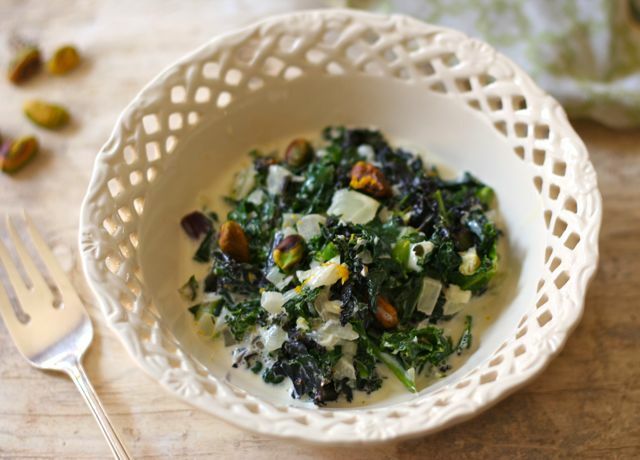 Place the sliced kale in a microwave-proof bowl, add 1/4 cup water and cover with a paper towel. Microwave on “high” for 1 minute. 2. Drain the kale in a colander. Pat dry with a clean kitchen towel. 3. Using a large skillet, melt the butter over medium heat. Add the onion and cook until limp, about 4 minutes. Add the garlic and cook for 1 more minute. 4. Add the kale, lemon zest, nutmeg and cream. Cook over medium-high heat for 5 minutes, until the cream is thick enough to coat the back of a spoon. Add salt and/or pepper, stir and remove from heat. 5. Using a food processor, pulse the creamed kale 4-6 times to smooth the texture a bit. 6. Pour into serving dish, garnish with the pistachio nuts and serve. This is great, I am so looking forward to trying all these great kale recipes I have been seeing. Hey Liz – I’m honored that you used my recipe and am thrilled with your individual touches. I’m not sure about the whole microwave thing, but hey….I always try to keep an open mind, so I’ll commit to trying your micro-blanching method one day. As for the meyer lemon and pistachios being added, all I can say is – YUM! you’re on a kale kick…love it! can’t wait to see what you do with it next! That creamed kale looks wonderful and comforting! Just the ticket for a chilly day. We like the looks of his original recipe AND how you have tweaked it to make it suit your own table and tastes. Well done! Thanks for putting our Organic Rainbow Kale to excellent use! Thanks, I think I’m done with kale for a bit – thinking about asparagus now that spring has arrived.